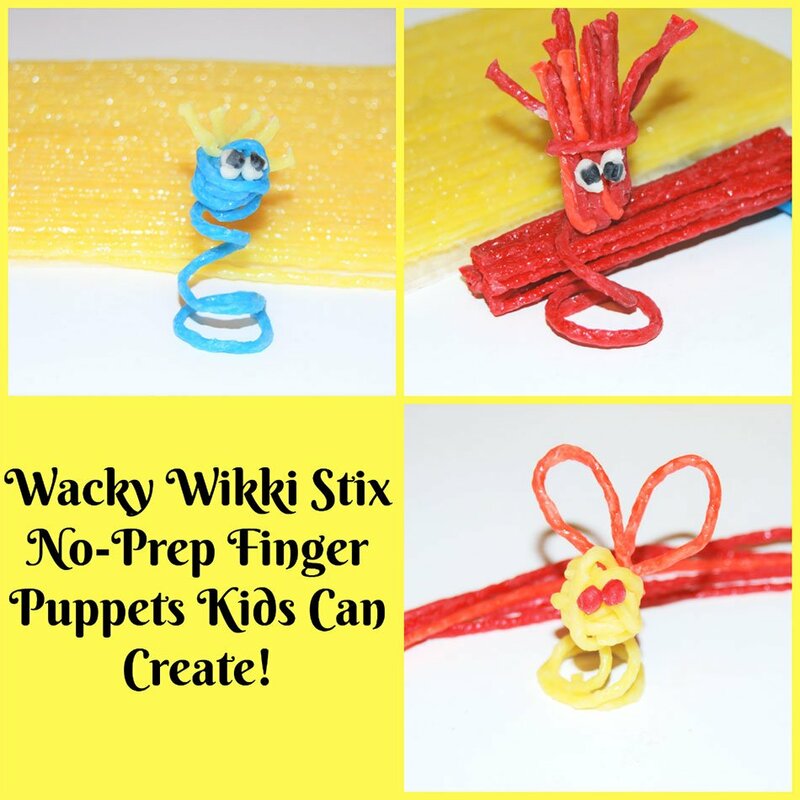 Wikki Stix No-Prep Wacky Finger Puppets for Kids! With Wikki Stix, kids can create fun and whimsical finger puppets that require no prep time for busy parents at home. 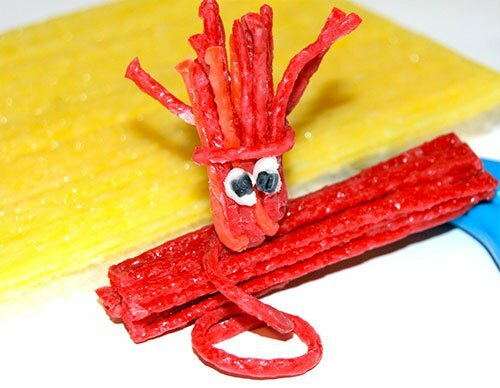 Gather your own Wikki Stix and see what crazy characters your own kids can create to play with today! Set out Wikki Stix and scissors on a table or a large tray. Invite kids to create any kind of finger puppet desired. In order to get started, kids may need to brainstorm suggestions with each other or an adult. 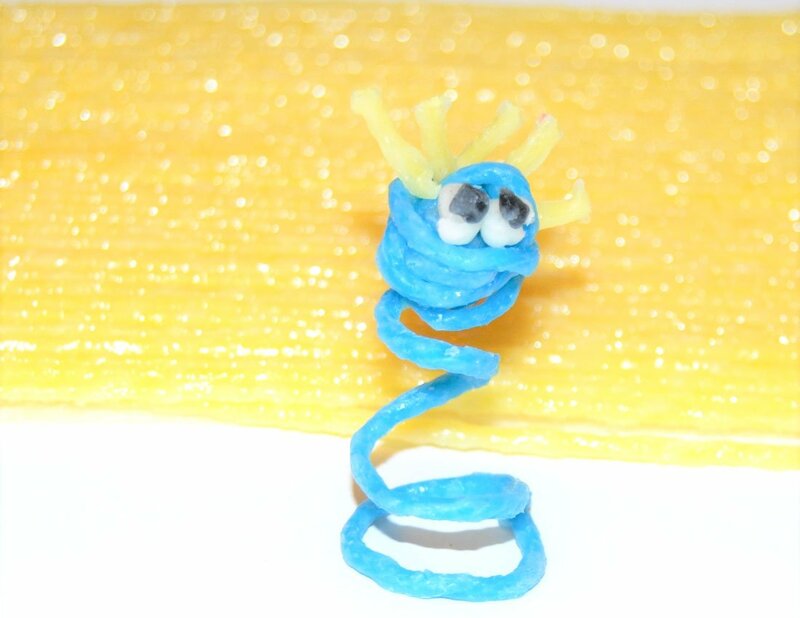 The base of the puppet is created with one Wikki Stix wrapped around a finger to create a spiral. Toppers for the spiraled finger puppets are limited only by a child’s imagination. No glue or tape is necessary as Wikki Stix are tacky and the pieces stick together with fingertip pressure. Create a seasonal character or shape (snowflake, snowman’s head, hearts, shamrocks, Easter Egg, Flag, Sunshine, Clouds, Pumpkins, Apples, Jack-o-Lantern, Turkey, Christmas Tree, or Star). Storybook characters: kids could create The 3 Little Pigs and a wolf to put on a puppet show for friends or family. Counting rhymes, such as 5 Little Monkeys, are fun to create, too. Movie characters: Minions, Turtles, or Olaf – what other movie characters do your own kids love? Kids can create finger puppets for Mom, Dad, or family members to wear, put on a puppet show with siblings and friends, or wear their own unique Wikki Stix puppet creations. To keep your kids engaged and creating throughout the month, try the puppets, crafts, and activities below with Wikki Stix! Valentine’s Day Heart Shaped Puppets for Play! There Was An Old Lady Who Swallowed a Rose – Sequencing Activity with Wikki Stix! Floating Hearts Sensory Bag with Wikki Stix! Low-Prep Valentine’s Day STEM Building Challenge for Kids! Create a whimsical character from your own imagination!